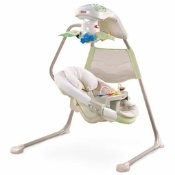 Our Cradle Swing gives the side to side motion of a cradle or change the position and it moves forward and back like a swing. The above head mobile and musical sounds keep baby occupied while freeing you for other tasks. Also included is a lap bar with toys. For babies up to 25 lbs. Styles and colors may vary.